It’s that time of year when homeowners are looking to refresh their living spaces both indoors and out. Decluttering is the first step to reviving those spaces as it gets rid of unwanted and unnecessary items taking up space. The second step is cleaning and disinfecting those spaces, but many people wonder if homemade cleaners are capable of doing the job. Natural cleaning products are an excellent way to clean and disinfect your living areas, but they have several other benefits as well. Most of our DIY cleaner recipes are simple to make and use ingredients you already have around your home, therefore saving you time and money. Homemade cleaning products are also safe for kids to use and won’t pollute the air you breathe. If you have been thinking of making the switch from harsh, store-bought cleaning products to non-toxic homemade cleaners, you might be wondering how to go about it. Do you throw out all of your old cleaning products and start over? Do you replace your old, store-bought cleaners as they run out? When making the switch, there is no set way to do it. You only do what you think is right. If you want to toss out all of your old cleaning chemicals before you use them, make sure you dispose of them correctly. Don’t just toss them in the garbage can or pour them down the sink. As you begin to replace your store-bought cleaners, you will notice that you don’t need as many natural cleaners as you would think. Many of our DIY cleaners can be used for a variety of purposes. As you begin to experiment with making homemade cleaners, you will notice most recipes use the same essential ingredients, which you should always have on hand. Stainless steel is growing in popularity, but it is also a magnet for dust, dirt, and all sorts of grime. Wiping down your stainless steel appliances daily with warm water and a microfiber cloth is great, but sometimes it needs that deeper clean. What you use to clean your stainless steel will depend on the clean you want. If you are after a smudge-proof solution that will allow your stainless steel to sparkle, you need something that uses lemon essential oil. If you wish to have a streak-free shine, you can use our natural stainless steel cleaning solution that is also great for windows. Granite countertops are desired because of their durability. Granite can withstand high temperatures, it looks nice, and when adequately sealed, can repel most stains. This doesn’t mean it doesn’t need a deep cleaning on occasion. Wiping down your countertops with warm, soapy water is a safe and effective way to clean them, but sometimes you need more than just dish soap and water. Rubbing alcohol is excellent for cutting through grime build up on granite, but you must work fast as the rubbing alcohol tends to evaporate rather quickly. Cleaning granite is one thing, but over time it can start to look dull. To restore the shine, you need to use a few ingredients around your home to make a homemade granite polish. Place all four ingredients into a spray bottle and shake to mix. After cleaning your granite countertops, spray with granite polish. Rub gently with a soft cloth in a circular motion. Leaving undiluted vinegar on your grout too long has disastrous results. Using methods with acidic ingredients, such as vinegar or lemon juice, is not recommended for unsealed grout. Instead of risking your grout, use easy-to-make DIY grout cleaner with gentle, but active ingredients. Form a paste with the baking soda, Castile soap, tea tree, lemon, and lavender essential oils. Apply the paste to grout with a brush. Let the baking soda paste sit for several minutes before scrubbing again with a wet brush. Use a cloth to remove any residue and rinse thoroughly. No matter how much you don’t want it to happen, a drain is going to clog at some point. Dealing with clogged pipes means contaminated backed up water and unpleasant odors. Luckily, with a few simple ingredients you have in the kitchen, you can make a powerful natural DIY drain cleaner that offers impressive results. For those of you dealing with hard water, those unsightly brown rings or white spots in your showers, tubs, sinks, and toilets come as no surprise. With hard water stains the sooner you take care of the deposits the less chance the minerals have of setting in. One of the simplest ways to remove hard water stains from glass surfaces, such as shower doors is with warm water and vinegar. Windows might require a heavy-duty window cleaner to remove stains. 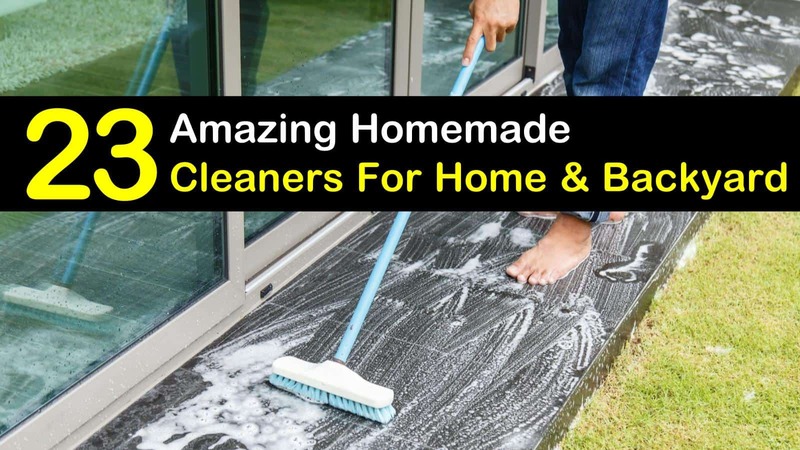 There are different homemade cleaners for different areas affected by the stains. An all-purpose cleaner is a necessity to have on hand when using homemade cleaning products. This cleaner is safe to use on a variety of surfaces and is powerful enough to cut through soap scum and clean toilet bowls. As the recipe only calls for a small amount of soap, it won’t even need to be rinsed. Inside a glass quart-sized spray bottle mix all six ingredients. Spray the solution on surfaces and wipe clean with a damp rag. If you are looking for all-purpose disinfectant mix together 1 cup vinegar and one cup hydrogen peroxide, spray the solution on surfaces, allow to sit for several minutes, and then wipe down with a damp sponge. Carpet is excellent to have as a flooring option, but daily traffic and accidental spills can leave behind unsightly carpet stains. Commercial companies and cleaners might leave your carpets looking great, but it is the residue they leave behind that is a problem. Using a home carpet cleaner recipe to clean your carpets provides the same results plus you know they are safe for walking. Wood floors require more care than other flooring types, but their beauty makes it worth it. Commercial cleaners for wood floors contain harsh ingredients that are often toxic to children and pets. A homemade wood floor cleaner recipe uses safe and effective ingredients that cut through the dirt and grime, as well as restoring the wood’s natural shine. Vacuum or sweep the floors first to remove excess dirt and dust. Mix oil and vinegar in a spray bottle. Spray cleaner directly onto the floor, and mop using a microfiber cloth. Commercial laminate floor cleaners often leave behind a sticky residue that seems to attract dirt and hair. Using homemade floor cleaner for mopping your laminate floors eliminates the stickiness and leaves behind a streak-free shine. Homemade laminate floor cleaners are safe and effective for both tile and wood laminate floors. Carpets get dirty, and sometimes you have to clean a small area of carpet by hand rather than with a machine. Cleaning your carpets by hand involves using a carpet brush to agitate the spot and then vacuum to pick up the particles. Baking soda can be used in place of deodorizers, but can also aid in stain removal. A bit of vinegar mixed with water cleans carpets and helps remove stains in carpets. Mix all ingredients in a small bowl. Apply to rug directly with a sponge or brush. Scrub the rug and allow cleaner to sit on the rug for several minutes. Rinse the rug using fresh water. Remove any excess water from the carpet with a squeegee. Cleaning jewelry is simple and involves several different methods. What homemade jewelry cleaning solution you use will depend on the type of jewelry you are cleaning and whether it has delicate stones or not. Jewelry containing delicate stones should be washed with warm water and dish soap. Costume jewelry must also be cleaned carefully, as vinegar, alcohol, and ammonia may damage it. Lightly tarnished silver is relatively easy to clean. Soaking it in lemon-lime soda will restore the shine. Foil and salt is another easy method you can use to polish silver. The electrochemical reaction with the salt and foil quickly dissolves the tarnish. For more silver cleaning and polishing recipes, please read our silver polish tips. Copper is sometimes hard to clean, but generally, warm water and a small amount of dish soap are enough to do the job. Lemon combined with salt creates a homemade abrasive cleaner strong enough to remove tarnish. To clean copper pots, mix ingredients to create a paste. Rub the paste on the copper with a soft cloth. Allow the paste to sit on tough stains and rub again. Rinse with warm water and dry. Despite what you may have been told, cleaning and polishing the brass around your home doesn’t take a special cleaner. Homemade brass cleaner and polish can be made with a few simple ingredients you already have around your house. Knowing what brass cleaner recipe to use requires you to determine if you have lacquered or non-lacquered brass. Remember when cleaning your leather furniture you want to avoid drying out the leather. Cleaning finished leather is easier than unfinished leather. To tell the difference read the labels or look at the sheen of the leather. If there is no sheen, it is unfinished. The easiest way to clean leather is by using a homemade recipe that cleanses and conditions your leather using olive oil. White vinegar is excellent for cleaning and maintenance, while lemon juice mixed with cream of tartar is a great stain remover. Not all upholstery is cleaned the same way. To make your upholstery look better and last longer you need to make sure you are cleaning it correctly. Before you use any upholstery cleaner on your furniture, you need to read and understand the manufacturer’s cleaning codes. The best homemade upholstery cleaning solution uses soap flakes and boiling water to create a solution that is great for spot cleaning. Removing pet urine stains from upholstery requires a different recipe, while stubborn stains need something else. Windex and other glass cleaners cause irreparable damage to LCD screens. Microfiber cleaning cloths are safe to use to remove dust and dirt from computer monitors, but how do you get rid of the smudges and fingerprints that are inevitable? Homemade monitor cleaners use a cup of distilled water and a cup of vinegar. Never use tap water as it can leave mineral deposits on the screen. Never spray the screen directly and never use paper towels as they can scratch the screen. Always spray cleaner onto a microfiber cloth to wipe down the screen. Do not to press too hard as it can damage the screen. When washing your microfiber couch, you need to avoid using acetone, carpet cleaners, bleach, and upholstery cleaners as they can ruin your sofa. Vacuuming your microfiber couch every week gets rid of dust and dirt, but sometimes it needs a bit more. A simple microfiber cleaner using dish soap and water is safe to use on water-safe couches. Gently blot the sofa with a dry cloth rather than scrub it so as not to ruin the fibers. Just because the vinyl siding is low-maintenance, that doesn’t mean you don’t have to clean it. Your vinyl siding gets grimy, and it can even grow mold and mildew. Pressure washers efficiently remove everyday dirt and grime but be sure to spread out the spray, so you don’t crack the siding. Sometimes the dirt and grime buildup is too much for just a pressure washer, which is where our house siding cleaner comes into play. The best part is the cleaner works well with a hose, pressure washer, or just a bucket and brush. Mix ingredients together inside a clean, plastic bucket. Use a brush to scrub the vinyl siding, making sure to apply solution from bottom to top. Rinse the solution off from the top down with a hose or pressure washer. Decks face all kinds of wear and tear. To keep them looking their best you need to give them a deep cleaning once a year and then reapply a penetrating sealer. What deck cleaning solution you want to use will depend on the condition of your deck. Algae and mildew require using chlorine bleach-based cleaner, while dirt and grease on decks will come clean with a mild cleanser. Unsightly oil stains on driveways and concrete patios are a problem for most homeowners. Rather than use harsh chemicals to remove concrete stains successfully, you can make your concrete cleaner with simple ingredients found around the house. Vinegar and water is an eco-friendly concrete cleaner that can quickly clean your concrete. Stubborn stains may require 100% vinegar to remove. Lemon juice can be used to remove rust stains. Baking soda, vinegar, Borax, and hot water work as a natural degreaser. How you clean your patio furniture will depend on what kind of furniture you have. Teak furniture can be washed with a solution of vinegar and water, while wicker furniture needs some ammonia added. Wrought iron furniture requires a small amount of dish soap, warm water, and a sponge or scrub brush. Instead of baking soda, you can use three tablespoons dishwasher detergent as in this simple patio furniture cleaner recipe. Mix and wipe down furniture with a sponge. Cleaning windows with vinegar is an efficient way to clean them. Vinegar removes any film and smudges while leaving your windows streak free. The good news is with vinegar you can use either distilled white vinegar or apple cider vinegar. If getting rid of streaks is proving hard, you will want to try a window cleaning recipe that uses cornstarch. Cornstarch reduces streaking, but you need to make sure it dissolves completely when mixing to prevent clogging. We hope our homemade cleaning products article has shown you that making the switch isn’t as hard as you thought. 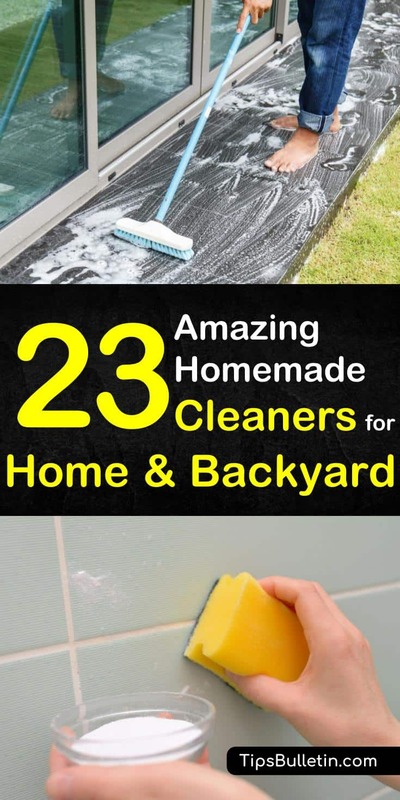 If you have found any of these homemade cleaner recipes useful, please share these window cleaning tips with others on Facebook and Pinterest.